The brown powder is made up of the millions of spores it makes in order to reproduce. 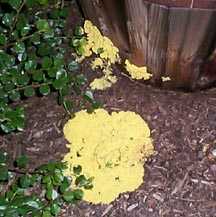 Other slime molds are tiny and difficult to find. Their spore-producing structures are not an ugly crust like Physarum, but rather beautiful colored spheres or Popsicle shapes.